The more the conversation loses sight of this history and the manifold ways in which the past remains present, the easier it is to misinterpret or mischaracterize our letter. So allow me to end with a reminder of where Agatha Christie's novel first began: a racist nursery rhyme about the serial murder of 10 Black children. It should never be easy to look past that. The economic debate about automation centers around whether it supplements or replaces labor. In Europe, the automation of goods sector jobs is replacing labor, demonstrated by rising youth unemployment and resistance toward accepting migrant workers. Low labor mobility leaves current laborers at risk of being replaced by machines, reducing opportunities for young people and displaced migrants in Europe. Industries and governments benefit from the reduction in labor costs and increase in production efficiency yet refuse to remedy the residual effects, such as displaced workers and high youth unemployment. On March 30, tens of thousands of Palestinians began wide-scale protests at the border between Gaza and Israel in what they termed the “Great Return March,” as reported by the New York Times. Protest activity and Israeli military activity has remained constant since, with Palestinian activists planning a climatic mass demonstration on May 15, the 70th anniversary of Israel’s founding. Supporters claim that Palestinians are peacefully protesting Israeli occupation of their land, while detractors claim the protests are unfounded and violent in nature. What should international observers make of this new movement, and how can further violence between Israelis and Palestinians be avoided? Students should be able to decide what art is and isn’t suitable for them. They should engage in liberal protest, such as turning away from the stage, holding signs outside, or – here’s an idea – not going to a play when they find it to be unsuitable. Twice in quick succession have students and most alarmingly faculty, deemed art unsafe for other students. We have set a dangerous precedent. In so doing, we are playing into the Right’s narrative about colleges. Universities have always been the bastion of free speech, as has the Left – and we are letting it be snatched from right under our noses. The price of college has been rapidly increasing, yet more and more people are going to college. If you’re making a surface level analysis, it sure seems similar to that housing bubble, with prices rising at absurd rates and consumption rising in spite of it. There are some questions to ask here. Brandeis, for all its efforts to be a model of diversity, fails to reach its potential as a truly integrated community. Many people will tell you that Brandeis tends to be “cliquey,” with people staying close to their groups of friends and occasionally reaching out to others outside of those groups. In the last month, some of this insularity among groups has come into the spotlight in the form of Brandeis Confessions, a Facebook page where anonymous students can post their thoughts on anything. Two comments in particular have focused on this aspect of Brandeis social life. One states, “As a person of color, I am considering threating [sic] because the presence of Orthodox Jewish men makes me feel uncomfortable.” The other states, “If Brandeis really cared about diversity, then Bethel would be performing at Springfest instead of two frat boys.” Both comments, to be clear, are wrong and should be denounced. 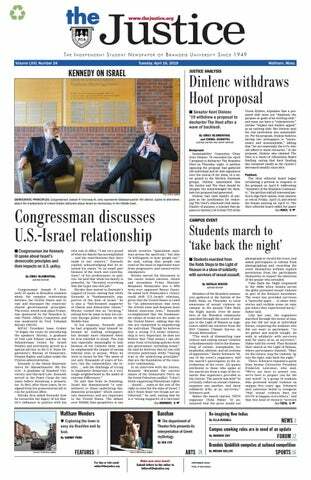 But what if the sentiment behind these comments, that Brandeis doesn’t care about diversity, is real? Last Monday, three members of the Brandeis administration stood before a town hall of students, professors, faculty, staff and alumni of Brandeis University to discuss the investigation of basketball coach Brian Meehan, in the wake of an April 5 Deadspin article that revealed numerous derogatory practices. This town hall’s efficacy was as dubious as any town hall, but it has opened the floor to a nuanced discussion about what Brandeis stands for and the value of diverse voices on campus. On April 5, Brandeis University fired men’s basketball coach Brian Meehan hours before the release of a Deadspin article detailing Meehan’s history of racist and unprofessional behavior and the University’s failure to address a formal complaint lodged by several players. University President Ron Liebowitz announced that the school has brought in an independent counsel to fully investigate the University’s process for handling complaints. How should the University handle the fallout from Meehan’s conduct, and what steps should be taken to ensure a fair and equal campus for all students? To the departing Ryan, I can only offer one piece of advice: Don’t let the door hit you on the way out. While one would hope that Ryan would manage to summon the barest amount of a backbone now that he’s no longer reliant on voter appeal, I suspect that he’ll remain just as craven as ever and enable President Donald Trump’s worst behaviors right until the very end. Since Kim Jong-un took leadership of North Korea after his father, Kim Jong-il, died in 2011, North Korea has been conducting heavy research on nuclear tests and missiles. Some analysts argue that their fierce rhetoric on nuclear power is just to strengthen their international standing, but their motives remain in question. Whatever the purpose is, the ramp-up is creating anxieties. If you want an example of how Facebook has failed its users, look no further than Cambridge Analytica. Founded in part by Steve Bannon, this conservative political consulting firm has found itself at the center of a recent debacle for Facebook. A March 17 New York Times article revealed that Cambridge Analytica had accessed the personal information of millions of American Facebook users without their permission. For people with mental health needs, health care providers conduct background screenings, and always ask for a detailed family history and personal history. If someone is a refugee or child of a refugee either from mainland China, Cambodia, or Rwanda, health care providers will know. People tell their needs and personal stories to their healthcare providers because there is always a basic level of trust between doctor and patient. President Donald Trump and Treasury Secretary Steven Mnuchin are preparing to impose $60 billion in annual tariffs against Chinese products, according to a March 19 Washington Post article. Supporters say that imposing tariffs will benefit American producers and curtail China’s growing economic influence, while detractors warn that tariffs could set off a trade war with China and destabilize global trade. Do you think the U.S. should impose these tariffs, and what effects could they have on the economy if implemented? Earlier this year, Le Holdings grabbed widespread attention among Chinese stock investors for the dramatic plunge of its stock price after it resumed trading following a nine-month suspension. On March 13, President Donald Trump fired Secretary of State Rex Tillerson and indicated he would nominate current CIA Director Mike Pompeo as his replacement, according to the New York Times. Tillerson’s firing comes at a crucial time, as the United States prepares to enter peace talks with North Korea and investigate Russian interference in the 2016 presidential election. How do you think Tillerson’s firing might affect the current administration, and what does it say for the future of U.S. foreign policy?